Modena in northern Italy is, without doubt, the spiritual home of the mid-engined supercar. And Detroit, Michigan, is surely the birthplace of the V8 muscle car. But where the heck on this forsaken planet, I hear you cry, do off-road vehicles with bespoke racking solutions and Chapter 8 compliant reflective liveries herald from? Cirencester, obviously. 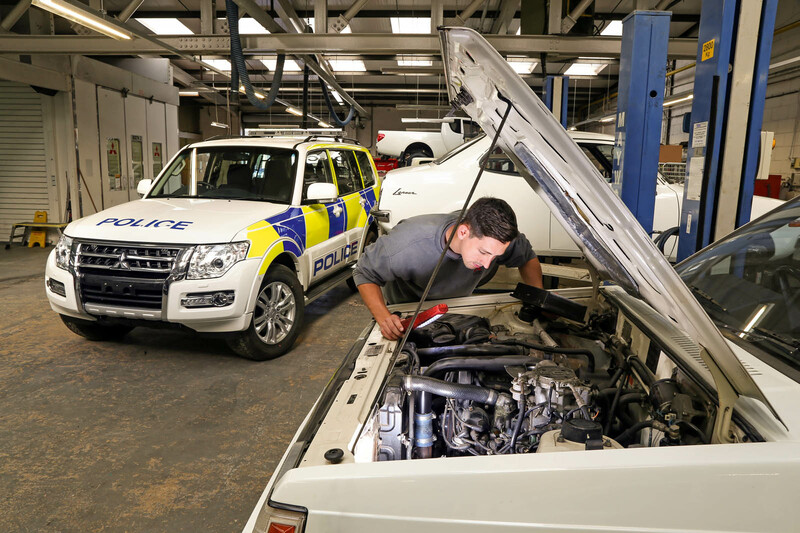 Established in 2002, Mitsubishi’s Specialist Vehicle Operations division modifies Shoguns, L200 pick-ups and Outlander PHEVs for telecoms companies, utility companies and police forces. Based in a sprawling unit on a busy industrial estate on the edge of the Cotswolds, M-SVO counts the Ministry of Defence, Sky, BT, the Metropolitan Police and the Highways Agency among its clients.“We were setup to help our fleet sales guys sell more cars,” says M-SVO manager Darren Hughes. “It started with one technician helping with police builds and it just kept on growing. Now we have 17 people working here and we build around 350 cars every year. “The Environment Agency has been a good contract for many years. We build Shoguns and L200s for it with amber lighting, Chapter 8 reflective chevrons on the back, off-road tyres, heated hand wash, that sort of thing. ITV has just ordered four Outlander PHEVs with satellite dishes on top.”You could drive right past M-SVO if you didn’t know it was there, so discreet is the signage outside. Through the sturdy perimeter fenceyou might just spot the unusually high concentration of Mitsubishis, though – almost all of them off-roaders and SUVs, some liveried in full police colours and kitted out with flashing blue light bars. Inside the unit you’ll find eight ramps, a paint booth and bodyshop, plus various fabrication tools, while the yard out back is stuffed full of dozens of 4x4s, all awaiting preparation or delivery. The department also prepares and maintains Mitsubishi’s fleet and press cars, as well as a collection of heritage vehicles. When we visited the facility, a couple of Evos were being prepped for an event celebrating Mitsubishi’s centenary, while the first ever UK press car, an immaculate white Lancer from 1974, was also being given a once-over. The vehicle that really caught the eye, though, was not really a Mitsubishi at all but a Willys Jeep. It isn’t restoration capability or vehicle preparation that sets M-SVO apart, though, reckons Hughes. Instead, it’s the division’s experience with the product. Having worked exclusively with Mitsubishis sinceit was formed 15 years ago, M-SVO knows better than anybody else how much racking can be squeezed into the back of an L200, or how much weight can be added to a Shogun before you need to think about upgrading the suspension. “We never like to say no to a client, unless what they want is unsafe,” Hughes says. “The most specialist thing we do here is dog unit conversions for the police. Those Shoguns take around 80 hours. They have two kennels in the back with air conditioning and lighting. 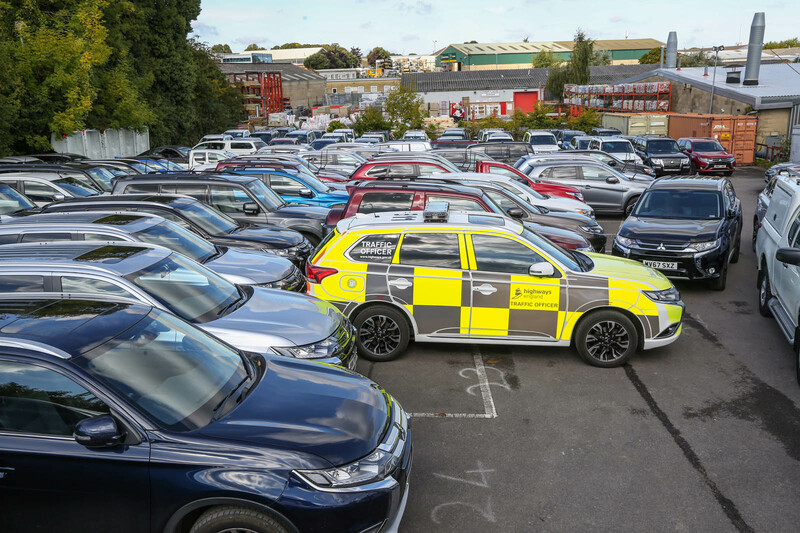 Perhaps the most unusual build the department has overseen, however, is a Grandis MPV that was converted into a mobile office for a former managing director of Mitsubishi UK. From the outside it looks like any other Grandis, save for the heavy window tints. Inside, though, it’s unrecognisable. The rear of the cabin was stripped out to make way for a pair of reclining captain’s chairs. There are folding desks, luxurious carpets and a television. The car is even equipped with a fax machine, printer and a docking station for a laptop (the audio-visual equipment was fitted by an outside company, but M-SVO managed everything else). Tricked-up MPVs, canine unit cop cars, decked-out pick-up trucks... Will Cirencester ever get the credit it deserves?